This could only happen to me. Have you ever questioned your sanity after an insane circumstance? 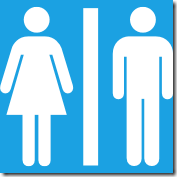 I never expected that going to a ladies room to pee would cause an alarm to go off inside my head. I seriously had a moment when I thought I might be going crazy. Not in a, “Oh, wow. That was weird,” kind of way. More like a, “So this is what it’s like to lose your mind,” kind of moment. I haven’t questioned my sanity very often. Like never. Last Saturday, I volunteered at WordCamp Denver. After I helped with registration, took a few informative classes about WordPress and drank three cups of coffee. I had to pee. No big deal, right? I met several nice women who could have followed me into the ladies room. Everyone was very friendly. Someone might have wondered if I was returning to the conference. The problem? I heard it over the intercom system! Being a logical human being, I tried to make sense of what I heard. My third thought: “How did they know I was in the bathroom? My fourth thought: “Even if they wanted me to return to registration, it’s pretty extreme to blast a message through the intercom system. I stepped out of the stall. A cleaning lady wiped down the sink. I decided to risk sounding crazy. If she thought I was hearing things, she could go ahead and judge me. I would probably never see her again, anyway. She nodded. Another cleaning lady walked out of the stall. She showed me her gigantic walkie-talkie. Neither of them had answered the question. Either the call was for someone else or they were hiding out for a while wondering when I would leave. Have you ever seen or heard something so strange, you second guessed yourself? Have you ever been to WordCamp? Right??? I’m glad I’m not going crazy. I do not care for when a place makes you guess which is the ladies bathroom and the mens bathroom. I had this happen at a brewery and when I saw urinals I knew I went through the wrong door – Oops! At least no one was in there – thank goodness for that saving grace. How embarassing! No, but everyone else does.